Kaitlyn will become your new BFF the instant you walk through our doors. She also always assures that the keyboards and pens in the office are sterile, so never worry about the pens you sign in with having any germs on them. If you see her muscles twitching, it is because of her kickboxing workouts, so don’t hold it against her. She has a contagious laugh and always knows how to make work fun. She is also a Registered Dental Assistant with nitrous oxide certification. 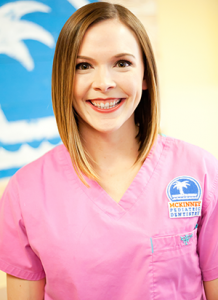 Her clinical knowledge combined with her awesome organizational skills, attention to detail, and ability to understand and connect with others makes her the best office manager. If you have questions about anything, she will always be there to help you. She and her husband Brice also love Texas Rangers games and spending time with family. Jill, the“office mom”, always makes sure that everyone is fed, that the office is clean and smelling good, and that the kids are comfortable. This crafty lady loves decorating everything and is sure to add her personal touch on the office during holidays. You may get a frozen hand shake once in awhile from Jill. But don’t worry, her hands just get cold sometimes, but her heart is very warm. Jill is always serving and helping others. 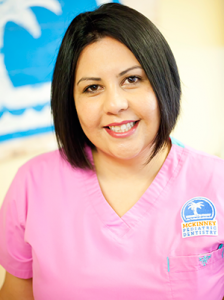 Her optimistic attitude adds to the positive culture at McKinney Pediatric Dentistry. 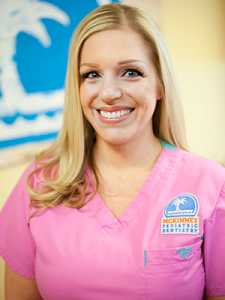 She is also a fully trained Registered Dental Assistant with certifications in nitrous oxide, sealant placement, and coronal polishing. Jill and her husband Chet have two lovely daughters. Most of our breaks at work include a heart-melting video of their youngest or a video of her oldest daughter doing cheer! Michelle has been married to her best friend and husband for over 30 years. She loves being the mom of 4 children, and a grandmother to 5 grandchildren! Michelle has a great love for people, but especially kids. Over the last 30 years, her experience with children includes working with special needs in elementary schools and as the Registrar of a Middle School. She also taught dancers in her studio. (Can you believe she was the first dance teacher for Dr. Schaack’s wife when Lisa was just 3 years old?!!) We joke about how much she must love her earpiece for phone calls…so much that she always forgets to take it out for lunch breaks and even when going home from time to time! Lauren is a Registered Dental Hygienist and a proud Fightin’ Texas A&M Aggie! Lauren graduated from Texas A&M University with her Bachelors in Psychology. She then went on to graduate from dental hygiene school in San Antonio. 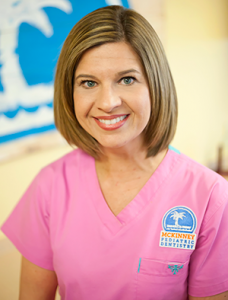 She pursued her passion to work with children and has been a part of our MPD team since 2012! Outside of work, Lauren loves to workout at her local Crossfit gym and spend time with her friends and family! She has a passion for live music, outdoor activities and traveling. (Fredericksburg is one of her favorite Texas spots to visit!) Lauren especially loves to travel abroad (Germany being her favorite spot thus far) and hopes to continue exploring the world for many years to come! 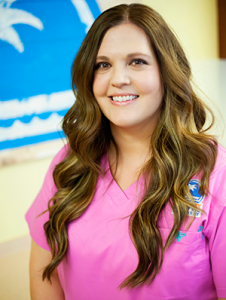 Amanda is a Registered Dental Hygienist and her passion is working with children. 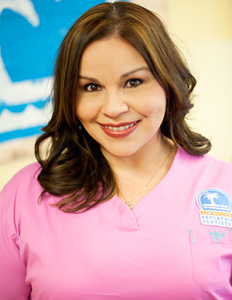 She attended the UT Dental School in Houston and has worked in a pediatric dental office setting from the time she graduated in 2006. Amanda is married and has three children. She is always calm, cheerful and pleasant to be around. She laughs easily and is a friend to all. In her free time she enjoys listening to music, traveling, and spending time with her family and dogs. She is a great “Cheer Mom”, which fits her well because she has such an encouraging and cheerful personality!! 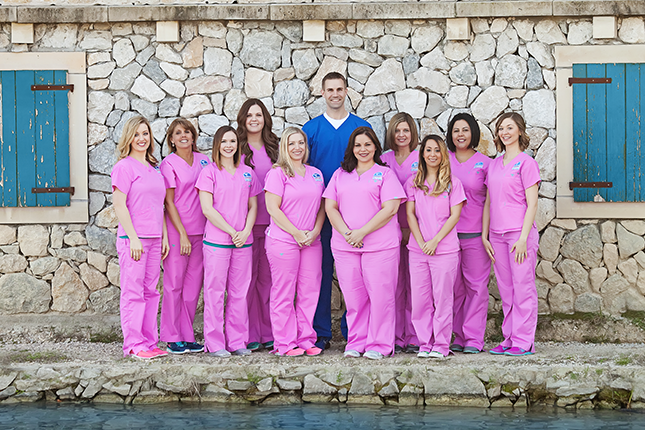 Alex is a Registered Dental Assistant with additional certifications in nitrous oxide, sealant placement, and coronal polishing. She also assists Dr. Schaack in the hospital at Children’s Medical Center. She is a perfectionist and a team player who is always eager to learn new things, advance her skills, and improve the office. Alex and her husband Tim along with their two fur babies, Sox and Tanner, just recently bought their first home. She enjoys cooking new recipes and spending time with family. If you’re ever in the mood for a dance-off or karaoke battle, Alex is your girl! You might catch her laughing, singing, and dancing around the office. If you hear everyone laughing in the office, it’s likely because of Stella. Her laugh is contagious! he can put anyone at ease with her smile and her ability to find the humor and fun in any situation. 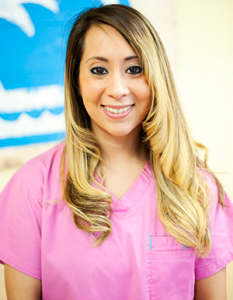 Stella is a Registered Dental Assistant with additional certifications in nitrous oxide, coronal polishing, and sealant placement. She also assists Dr. Schaack in the hospital at Children’s Medical Center. She is a California native and is fluent in both Spanish and English. She is married with three kids and has lots of extended family in the area. Stella enjoys a good mani/pedi and an afternoon of shopping in her free time. 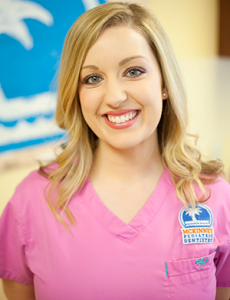 Jessica is a Registered Dental Assistant with additional certifications in nitrous oxide, sealant placement, and coronal polishing. She enjoys driving home to Greenville to spend time with her family and her boyfriend Clay. She enjoys dates nights and working out. Boxing has become a big part of her life and she enjoys it as much as she can. She looks forward to random road trips and her once-a-year camping trip with her family. Mindy was excited to join our team in 2015 and she loves all the kiddos. Why wouldn’t she? She grew up in family with 8 kids and was always helping out with the little ones and now has 27 nieces and nephews! 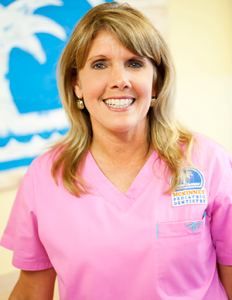 Mindy is a Registered Dental Assistant with 12 years dental experience. 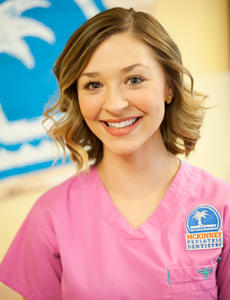 She is also certified in nitrous oxide, sealant placement, and coronal polishing. Mindy and her husband have been happily married for almost 19 years and have enjoyed raising their two children here in McKinney for the last 14 years. Her kids both attend MNHS and have busy teenage lives. Outside of work and family Mindy loves shopping, crafting and even teaches the 3 year olds Sunday School class at church! Oh, and she always has the cutest nails!